Why use graphics on your moving billboard? More companies, small and large, are using vehicle graphics to reach their audience. Vehicle graphics can effectively communicate YOUR MESSAGE and take advantage of your vehicle’s potential for advertising and branding. Call on Sign-Rite, our team is well trained and will provide first class application. You will need a great installation team to achieve a long lasting vehicle graphic. Sign-Rite is your partner for fleet graphics, bus graphics, truck advertisement, railway graphics, tram graphics, boat graphics and even aircraft graphics. If you are managing a fleet of company vehicles or have a single vehicle, Sign-Rite will create graphics for your unique vehicle wrap. There is a lot of space on your trucks. Using your truck as a billboard for your brand is smart – Sign-Rite can help. Sign-Rite installs reflective graphics. We’ll ensure a safe journey at night for all your critical services. Our designers will make your boat stand out with our graphics. You can style your own boat or add sponsors logos. We’ll give you the peace of mind that our graphics will last when you’re boating. Our vinyl wraps for car wrapping can change the face of every one of your vehicles. Let’s get your car, truck and van fleet wrapped. Your in business and need to get your message to your customers. We can help you do it while you’re on the move. 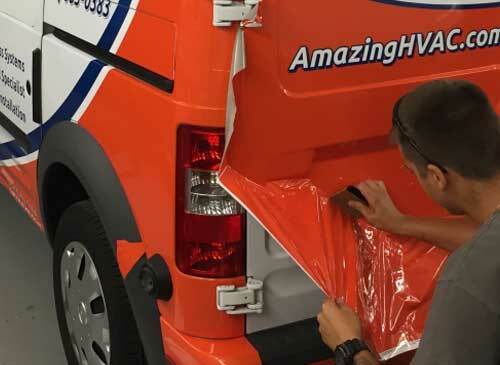 Vehicle wrapping is easy with the Sign-Rite team. Since 1985 Sign-Rite’s team has been doing great work for our clients. Our team takes the time to ensure your vehicle is cleaned well and prepped correctly. We understand this in an investment in your business and we encourage you to wrap your trucks, vans and other vehicles – and start seeing immediate results for your business. We provide the highest quality vehicle graphics. We are sure you will find that the more you drive, the more exposure your business will get. With a Sign-Rite vehicle wrap you will grab the attention of your prospective customers quickly. Fleet Graphics and corporate vehicle branding have far more staying power than just words. We’d like to be your vehicle graphics go-to partner. Every vehicle in your fleet provides you with an opportunity to advertise your company. From stickers, banners, signs and safety signs, to Truck Graphics, Custom Wraps, or Boat Wraps – Sign-Rite wants you to look good and be remembered. Call us today at 706.760.7430 to speak to your Sales Representative. We can offer on-site installation locally, we have a network of certified graphic installers nation wide. We can also ship vehicle graphics directly to you. We use only the finest materials for your budget and project needs, and are available to answer any of your top concerns regarding your graphic sign or design project.